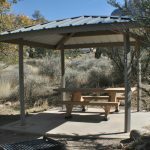 Post 105: Aguirre Spring Campground, NM - A Snails Life and Lovin' it! Bill found Aguirre Spring Campground, just past Las Cruces, NM in Campendium. 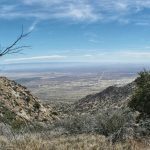 This is actually BLM land but there is a cost was $7.00 per night to stay in a very pretty, unique area. There is water available at the Camp Host site. The one fact that made us very hesitant to come here was the note on the write up: “Trailers over 23′ are not recommended”. This was due to the road leading up to the camping area being very long and winding. Four miles of narrow 2 lanes from the highway in, which then narrows even more down to 1 lane, 1 way for another 2 miles. This last 2 miles is the longest 2 miles (8 mins of Joy’s life lol). Two VERY VERY long, narrow, winding and steep 2 miles. As we have mentioned often, our trailer is 31 ft, with our truck we are 50 ft in total. Bill spoke to the Ranger at the front gate who said, “It would be tight, but if we took it slow, we could make it.” Words of confidence lol. The Ranger was super friendly and offered Bill a few more tidbits of advise before he left. Bill looked at Joy and suggested that he could either leave the trailer at the gate and take Joy and the girls up first to look at the road and find a spot, OR we could just go up together and go slow. Joy in a moment of courage said,”Lets do it together.” Joy always trusted Bill’s driving and his capabilities. If the Ranger said it could be done, then Joy knew Bill could do it. Besides, we had read in Campendium others had taken a 30 ft trailer up before us, so how bad could it be? Lol well, that depends on who is asking lol. Four miles (from the Ranger’s station) never seemed so long to Joy before in her life. We had Google Maps on, so Joy could see every twist and turn coming before Bill saw it. Joy could also see how far we still had to go. As long as Joy concentrated on watching google on our phone, she didn’t look out the window (much) at the narrow road and steep drop offs. In the beginning it wasn’t bad at all. The first mile or so, we were on a narrow 2 lane road. Joy thought this isn’t so bad. Then we came to a Y in the road where the road became one way up and 1 way down. By the way, YOU DO NOT WANT TO GO LEFT HERE! The left part of the Y intersection has a metal SPIKE strip across it. To PREVENT people from trying to go up the WRONG way and run head on with someone coming down on the 1 way road. That spike strip will tear your tires to shreds quite nicely we thought :). The 1 way road now became more narrow if that was possible. The road LOOKED only wide enough for the truck, never mind being big enough for the trailer which is wider than the truck. This is where Joy kept her eyes glued to the Google map on the phone. Occasionally sneaking a peek out the window at the road ahead or her side window. With great trust in Bill and his skills, Joy kept him informed of how much further we had to go and when a sharp hairpin corner was coming up. Bill took the climb very slowly watching both front of the truck and the wheels of the trailer. Driving with a calm assurance. Above is the link to our Youtube video of our drive up. The speed of the video has been increased 1.5 times so make it a bit shorter and edited in a few places. Hope you enjoy! The climb was very slow and nerve racking for Joy, but never once did Bill get nervous or show any signs of stress. When we were at the campground, we looked at the map on a sign post and decided to turn right. We did one loop, thought we found a spot big enough for us, but found we could not back into it. There was not enough space on the narrow road to back up at an angle. Luckily just one spot down the road, a couple who were parked in a large spot, came up to Bill in the truck and offered to move. They told him they didn’t know where else to park, but they were only there for the day so they would happily move for us. That was perfect, Bill was able to drive down the road a few hundred feet and back up into this gorgeous corner site. We had long grass and plants between the front door and the road, huge boulders and our own private neat metal trash can. At the back of our site was a metal covered picnic table that was quite nice. Situated on a cement pad. 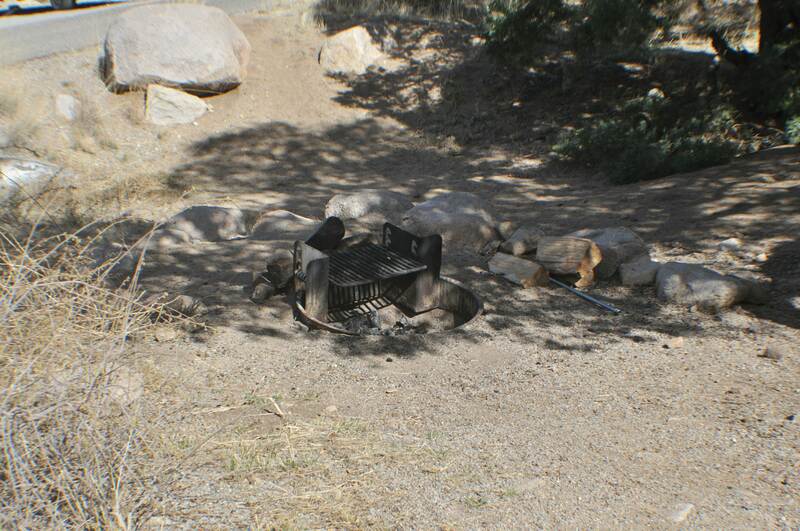 We had a black metal fire ring with an adjustable rack for cooking on, AND a BBQ grill. Our site 28 was well treed and mostly level. 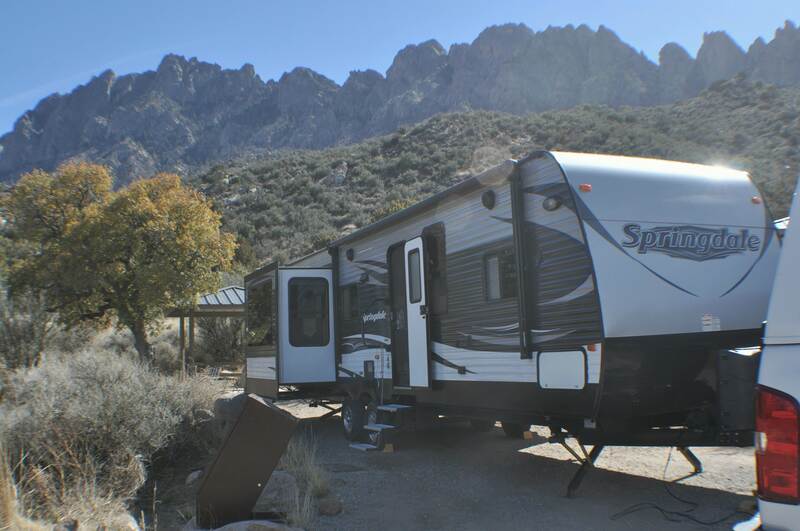 We could sit out behind our trailer to relax in the shade or sun and look out on the most gorgeous view of the Organ Mountains. We even had plenty of room in front of the trailer to park the truck. 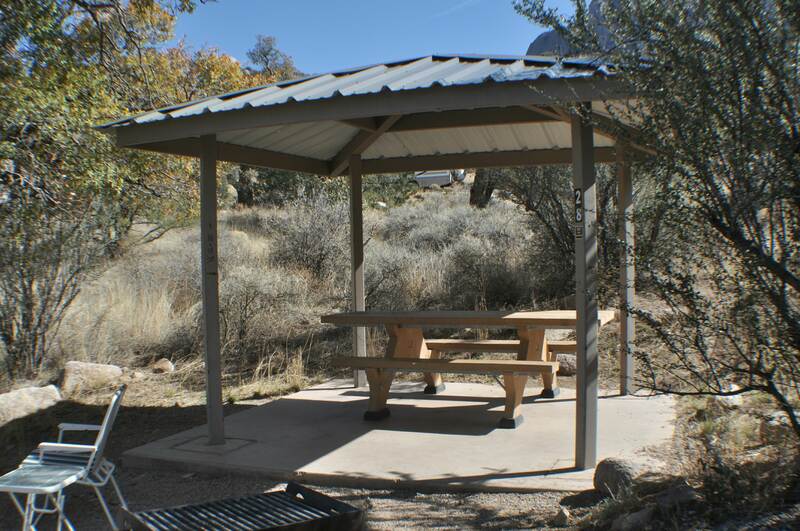 From Joy’s research she found out that the Aguirre Spring Campground is situated at the base of the cliffs overlooking the Tularosa Basin and White Sands National Monument. 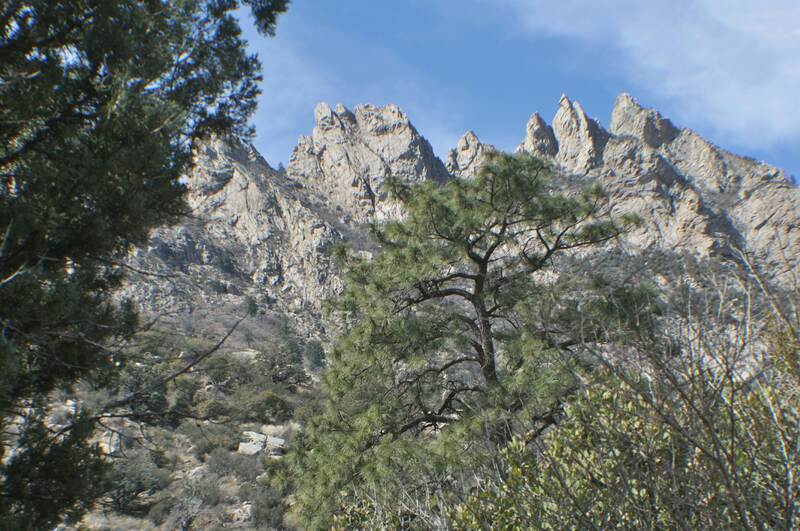 Alligator juniper, gray oak, mountain mahogany and sotol are a few of the abundant plant species here. 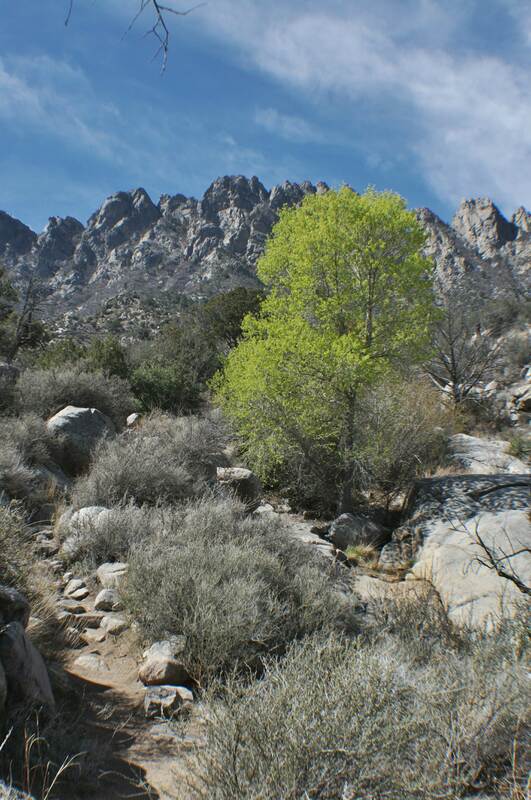 Seasonal springs and streams occur in the canyon bottoms, with a few perennial springs that support riparian habitats. Trailer nestled in the trees with the mountains in the background! 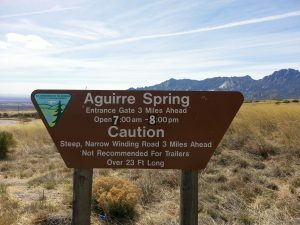 Aguirre Spring Campground, is actually a perfect location. 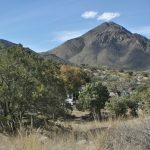 We are not far from Las Cruces, a big city, for any shopping needs we may have (including laundry! 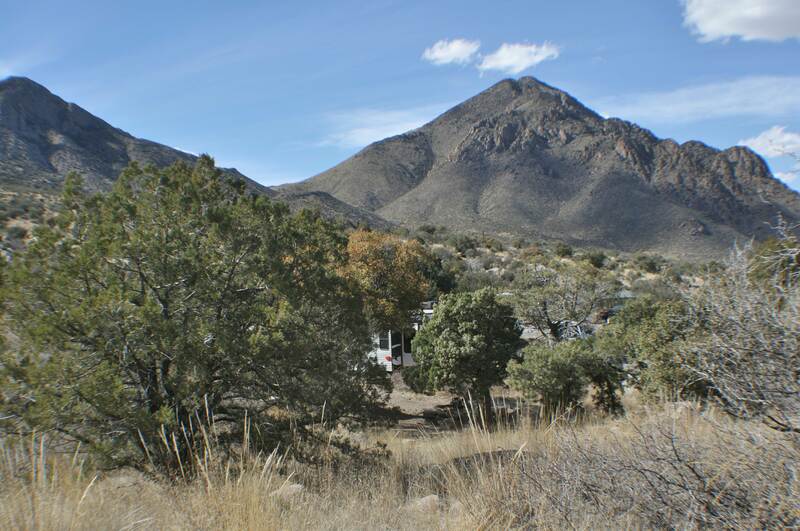 ), the view is spectacular, the campground is pretty and super quiet at night. Joy’s only comment would be the ride up lol. On a good note, the ride down was not as bad what so ever. Was a little winding, but not nearly as steep or have as many sharp curves. But at the bottom, they did have another KILLER SPIKE STRIP to prevent people from going up wrong way on the 2 lane highway. Just as a reminder to stay on your own side lol. 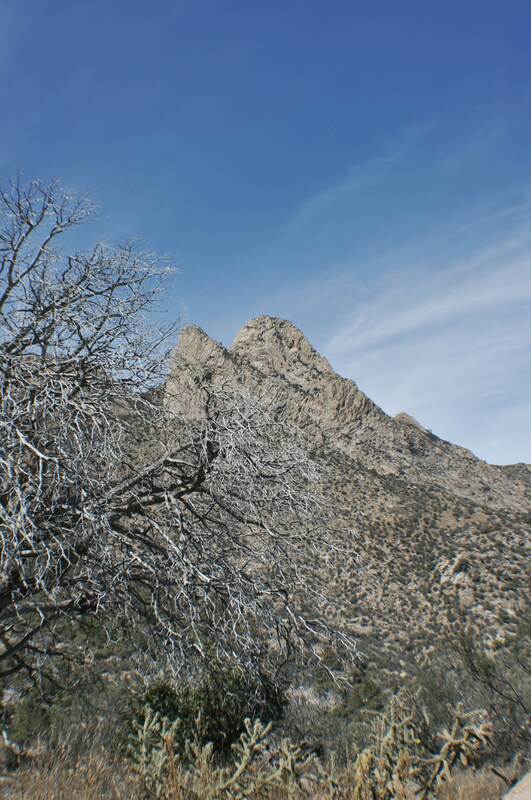 There are 6 hiking trails accessible from Aguirre Spring Campground. Bill was chatting with a fellow camper and he recommended the Pine Tree trail . It was about 4 miles long and it was rated “moderate difficulty”. So the next day Bill got his camera gear ready, filled up water bottles, packed a bowl for dog water and he and Lucky headed out to explore the Pine Tree Hiking trail! 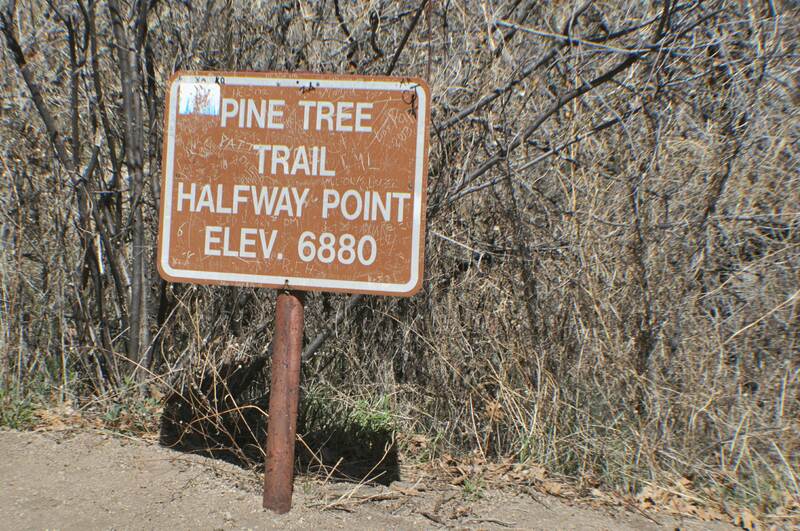 They walked to the trail head with was only a 1/4 mile or so, looked at the trail map, logged in and they were off! Scenic view on the Pine Tree Trail. When they returned Bill said it was a fantastic hike! 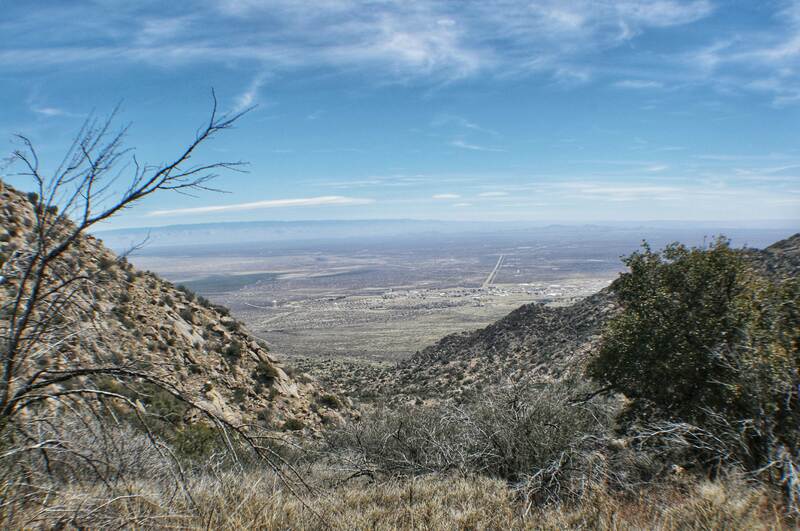 Gorgeous vistas, the trail was well maintained, but it was not a stroll in the park lol! It was both challenging and fun! Lucky was pretty tired as was Bill lol. Bill mentioned that having Lucky along was great fun – Father / Dog Daughter bonding time. They stopped often for photos, water and/or sniffing breaks. One perk was that Lucky would help pull Bill up the climbs, on the other hand, the downside (pun intended) going down the decents having a dog pulling you down made it more difficult than it had to be lol. Several times, Bill let Lucky loose so he could maintain his balance lol. If you are in the area, we highly recommend this campground! contrasts - flourishing vegetation, with the stark mountains in the backgound. The halfway sign was a welcome sight! Looks to be a very nice spot once on top, however, I’m with Joy and that trip! !